How photographs contribute to understanding refugee history: Kukes, the Kosovar refugees and lessons for refugee aid — Refugee History. The border is about to open. The main street of the Albanian town of Kukes, 20kms from the Kosovo border, is lined with tens of thousands of jubilant and cautious locals, interspersed with Kosovar refugees, who’ve been waiting, seemingly endlessly, to return home. “The atmosphere was incredible, euphoric – the crowd was chanting ‘NATO, NATO, NATO’”, says Christian Oster, a Danish aid worker who was in Kukes with his camera that day. At 23 years of age Christian was offered the opportunity to manage a food distribution programme in Kukes refugee camp for up to 30,000 refugees. Around 300,000 refugees fled Kosovo via Kukes, and either remained in or around the town, moved further south, or travelled abroad. In an interview for Refugee History, which is available to watch below, Christian describes his experiences in Kukes, lessons for contemporary refugee aid and the photographs he brought home. German military convoy in Kukes. Courtesy Christian Oster. Nineteen years since the Kosovo War, Christian now lives in Sydney and works in the medical technology sector. With his Konica film camera Christian scans the crowd gathered along the main thoroughfare of Kukes, noting the presence of UAE security forces marked by their red berets holding back civilians and refugees, alongside aid workers from around the world. The way is cleared for NATO’s arrival. First, the sound of military carrier vehicles begins to pierce the cheers of onlookers, now brimming over balconies. Then the chopping sound of chains hitting the pavement - the tanks have arrived. Slowly the distinct insignia of the German soldier riding atop comes into focus. Over Christian’s shoulder an American marine appears from out of nowhere. Binoculars are brought to the marine’s face, and in a few moments a salute is shared between him and a German tank officer. In one of those rare instances of perfect timing, Christian captures this moment on film. “The photo of the German saluting the American is probably the most interesting photo I have ever taken”, Christian says. 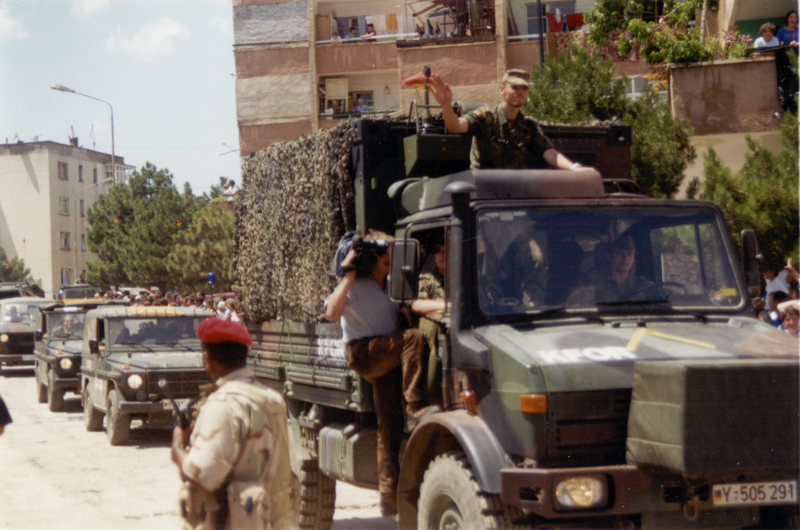 TV cameraman rides on troop carrier in Kukes. Courtesy Christian Oster. Christian’s role in the Kukes refugee camps primarily involved managing a team of local Albanian-speaking managers working for the aid distribution programme, who in turn were responsible for around 50 team members. Christian was also in charge of security communications with the UN, “as well as being the resident accountant”, he says. Distributing food to refugees in Kukes. Taken by unknown photographer, courtesy Christian Oster. Photographs taken by Christian were intended for his personal use after the war, but he was also gifted photographs from a ‘random’ professional photographer (who remains unknown) as a gesture of ‘thanks’ for being permitted to document the Kukes refugee camp. Both of these photographic collections appear in Generosity and Refugees: The Kosovars in Exile. In the above image, the viewer is brought by the photographer into the immediate space of the subject whose individual circumstances must be explained - by a broader reading of the context - in order to understand the significance of the subjects’ demeanour. What do photographs contribute to broader historical understandings, and specifically, to this chapter of refugee history? More importantly, what does historical interpretation contribute to understanding photographic records of the past? 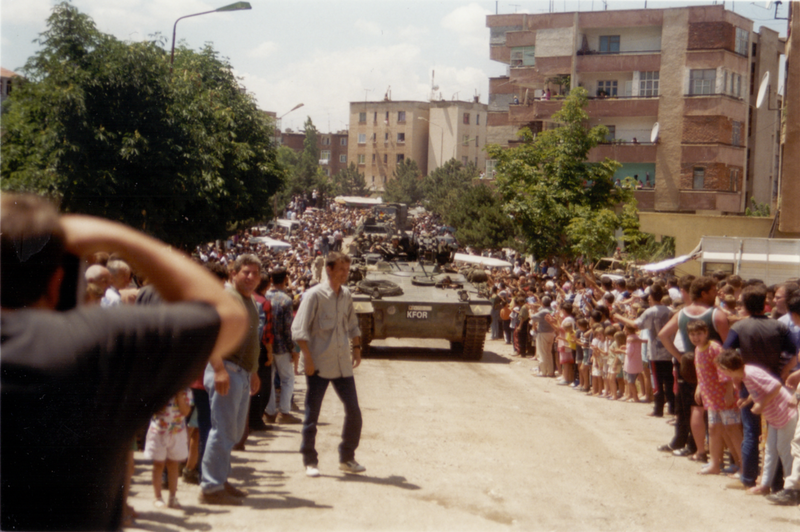 Photographic representations of children in western media coverage during the Kosovo War can be understood to have invoked an urgency about the conflict among NATO-allied media audiences, which had the effect of building support for the NATO intervention. Likewise, Buckley and Cummings argue that NATO states needed to publicly justify the fighting, by selling war to democracies that were not being attacked, and to demonise the leader of the enemy – Slobodan Milosevic – as inhumane. Media framing (see Entman, 2007; Herman and Chomsky, 2008) enables us to understand the use of these images as a series of deliberately managed choices in the media production process. Drawing on this method, a significant portion of news articles and photographs published in the Australian news sources that I analyzed for Generosity and Refugees: The Kosovars in Exile centered on the plights of Kosovar refugee children. Content analysis shows that the number of children depicted far surpassed depictions of adults. Within this coverage two key frames were (the loss of) ‘innocence’ and (a chance to redeem and rebuild) ‘hope’, such as in the media examples below. Sources (left-right): The Daily Telegraph 19th April 1999; and, The Daily Telegraph, 8th May 1999. Images of child refugees continued to be utilised in Australian news media once the Kosovar refugees were evacuated to Australia. The central image of a smiling child donned the front page of The Daily Telegraph on 8th May 1999, which was dedicated to the landing of the first Kosovar refugee evacuation flight at Sydney airport. One conclusion is that media images of refugee children enduring the violence of war were intended to generate among audiences a sense of moral urgency, promoting emotional disbelief and outrage. On the other hand, media images of refugee children at ease and smiling while in Australia’s care in the post-evacuation context were aimed at generating feelings of goodwill among readers. These representations paralleled the Australian government’s policy positions both as supporters of the NATO alliance, and in supporting its publicity campaign to appear ‘generous’ towards a widely popular group of refugees. “Having said that, it wasn’t easy, we worked seven days a week without a break, and some days up to 18-20 hours,” Christian says. Asked whether any parallels can be drawn in terms of the challenges faced by refugee aid delivery today, Christian points to the scale of current refugee crises and the need for large and efficient cross-organisation cooperation. Post-Kukes recovery and recuperation was somewhat difficult, Christian explains, who says he took a year off after the war, and headed for Pristina for a brief role with World Vision, before moving out of the aid sector altogether. “Life does and it doesn’t return to normal”, Christian says.